Outdoor School is a multi-campus P-12 residential school (15 Mile Creek Campus and Bogong Campus) within the Victorian Department of Education and Early Childhood Development (DEECD). We are one of 3 schools within the Residential Outdoor Schools Association (ROSA). The other schools are Rubicon Outdoor Centre (Nayook and Thornton Campus) and Somers School Camp (Somers and Woorabinda Campus). With our core purpose being to “educate for sustainable living”, Outdoor School campuses offer primary and secondary school students a wide range of outdoor and environmental education programs and cooperates closely with schools and other users to structure programs which best suit their needs. The Outdoor School is a member of the Residential Outdoor Schools Association. This association has two other schools in its membership, being Rubicon Outdoor Centre and Somers School Camp. Each school has two campuses. 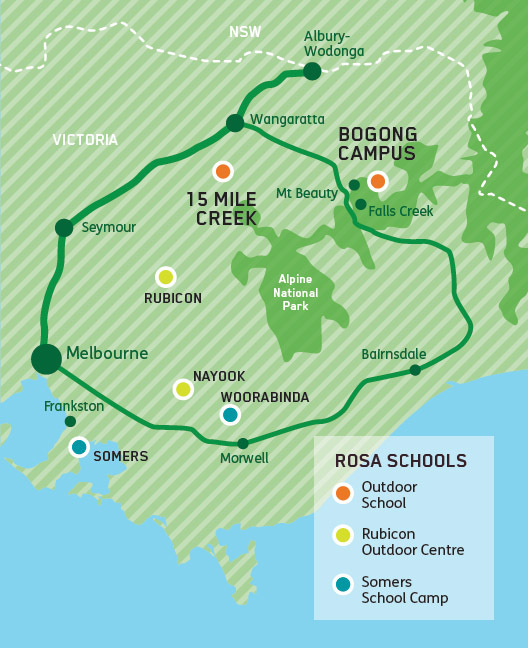 The Outdoor School consists of 15 Mile Creek and Bogong campuses, Rubicon Outdoor Centre consists of Nayook and Thornton campuses, while Somers School Camp consists of Somers and Woorabinda campuses. The Bogong campus is located in the Alps of North East Victoria within Bogong Village, approximately half way between Mount Beauty and Falls Creek. The Bogong High Plains is 16km or 30 minutes drive away, which provides us with a very powerful learning environment. We use the area for many activities which are integrated into our curriculum. Please select a campus below to view more about it. Situated in the Alps of North East Victoria, providing a vast and powerful learning environment. An engaging learning environment spanning 110 hectares of unspoilt bushland in Victoria’s North East.